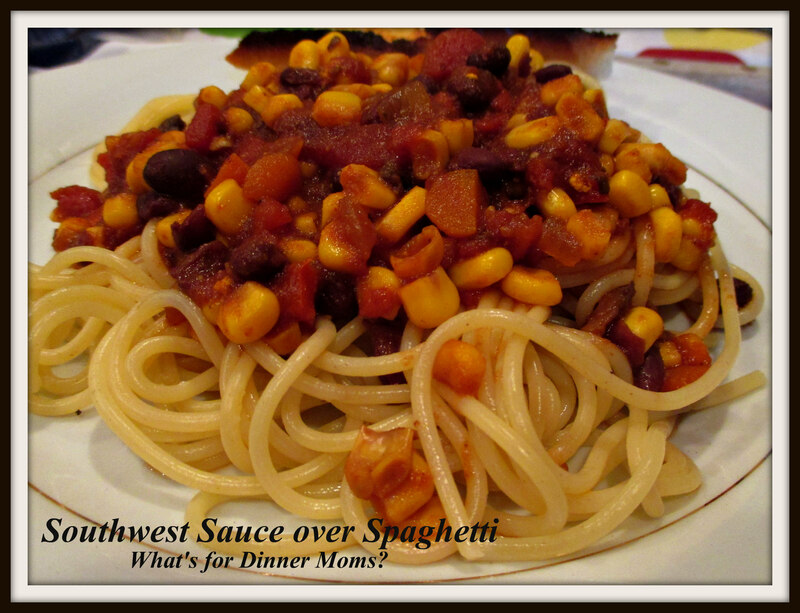 Southwest Sauce over Spaghetti – What's for Dinner Moms? It is tax season in our house. Well, the last of two tax seasons actually. I prepare personal income taxes from February through April and then my partner works in a State Tax Department so her busy season is mid-August through early December. What that basically means is she gets up and arrives at work by 8:00 am and stays from anywhere to 9:00-10:00 pm or later. We have done this for 15-16 years so we are used to it. My only rule is if at all possible home by 6:00 pm on Fridays for family dinner and 7:00 pm on Sundays to get ready for school on Monday. The kids used to go days on end without seeing her when they were little. They would be in bed asleep by the time she got home and up and gone in the morning before they were out of bed. Now that they are older they may still be awake at night and she gets our son up and takes him to school (once school starts) because she can drop him off on the way in to work. So, family meals are a bit different during this time. Whatever we have for dinner is what she will eat for lunch or dinner the next day at work. I have learned to fill her divided container for the next day when I serving dinner so that there is a nice serving for her the next day. Otherwise my son may pick at it until it is gone or not enough to feed a mouse. At the end of last week I made a Slow Cooker Vegetarian Chili (click for link). It was delicious and easy but I had quite a bit leftover and didn’t really want to freeze it so I decided to transform it into a new dish. It was so simple that dinner was ready in less than 20 minutes! This was hearty and good. Both children shredded a bit of cheddar cheese over their dishes and added a dollop of sour cream on top to cut some of the heat. My son added extra hot sauce to spice his up even more. The best part is that this is part of a cook once eat twice meal. Make a huge vat of vegetarian chili for one day and a few days later you can have Southwest Pasta. The chili freezes well so you can make this up to three months after you freeze your chili! I served this dish with a side of green beans and a green side salad. For my mostly gluten-free son I served his dish over gluten-free pasta. In a large saucepan mix the chili, corn, cumin, chili powder, and garlic powder. Heat over medium heat stirring often. If needed thin a bit with vegetable stock to desired consistency. Taste and adjust spices as needed. Serve over pasta with cheese, sour cream, onions and hot sauce as desired. That looks great! And you are on a tear finding vegetarian recipes. It sounds like everyone is going along. So far so good. Eating far too many carbs but that will change with time I am sure.